the booster has been released. Sea-skimming cruise monitored by radar altimeter/active radar terminal homing. Some countries, including the USA, do also carry an airborne version of this missile. This version is a little shorter lacking the booster. 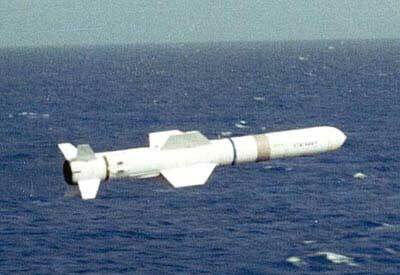 Under a 1998 agreement between Boeing and the US Navy, an advanced upgrade to Harpoon missile was developed. This Harpoon Block II missile incorporated Global Positioning System-assisted inertial navigation, which enables the system to have both an anti-ship and a land attack capability. Denmark and Canada were the first countries outside the USA to adobt this upgrading (2005). A normal mount normally carries 4 canisters, bu du primarly to weight problems the guided missile boats of the WILLEMOES Class were mostly only armed with two missiles per mount. The frigate PEDER SKRAM accidentally launched a HARPOON missile. The SSM missile strikes a residential area close to Lumsaas in North Western Zealand. Fortunately, no people are injured.